To continue a tradition of excellence and integrity in a safe, supportive and respectful environment where all students will be equipped with the knowledge and skills to be college, career, and life ready, as well as contribute as responsible citizens of their local and global communities. Del Oro High School is located in Loomis, CA and is one of six high schools in the Placer Union High School District. Opened in 1959, Del Oro is situated on approximately 56 acres serving students in the ninth through twelfth grades. Our enrollment for the 2017-2018 school year was 1,752. Our ethnic make-up consists of 11.24% Hispanic/Latino, .57% American Indian/Alaskan Native, 1.43% Asian, .11% Pacific Islander, .51% Filipino, .41% African American, 78.08% White, 7.25% two or more races, .80% not reported. Del Oro serves a semi-rural community trying to maintain slow growth while being surrounded by communities of high growth. There has been a phasing out of the agricultural way of life and an increase of homes on acreage and small housing tracts within our attendance boundaries. The area is becoming a bedroom community for the greater Sacramento area. There continues to be slow growth of businesses within the community, but the existing businesses are generally very supportive of Del Oro. Del Oro draws its students from two elementary districts which are composed of seven K-8 elementary schools. In addition, approximately 350 of our students are on inter-district agreements from surrounding districts, and 106 are intra-district/open enrollment from one of our district high schools. The school is located a few miles from Sierra College, which allows many students to attend concurrently. In 2011, Del Oro was named a California Distinguished School by the Department of Education. In 2012, Del Oro received the maximum 6-year accreditation from the Western Association of Schools and Colleges (WASC). Athletics & Extracurricular’s at D.O. ways to get involved with D.O. outside of school and outside of sports. Please visit our “Clubs” webpage to see the list of clubs offered at Del Oro. Q— The data on the internet about the different schools in the area gets somewhat confusing. From those statistics, what is the most critical in illustrating Del Oro's success? Del Oro Graduates 97.5% of all students. The Average S.A.T. Scores of Del Oro Students who took the exam in 2016: Critical Reading (529), Math (541), and Writing (504). 44% of the 2016 graduating class applied to, gained acceptance, and is attending a 4-Year College. Del Oro High School is accredited through the Western Association of Schools and Colleges (WASC) for 6 years (2013-19). Del Oro has a diverse student population, staff, and faculty. In the last 10 years Del Oro has won 55 S.F.L. League Athletic Championships and 25 CIF SJS Section Athletic Championships. Q— What are some of the course offerings that students can take at Del Oro? In addition to the education that all K-12 schools in California has to provide per the state education standards by subject, Del Oro exceeds those minimums. Here are some of the highlights. 19 Advanced Placement (A.P.) Courses Offered in 2017-2018 school year including: (2) English, (4) Math, (6) Science, (4) Social Science, (1) Spanish, (2) Art. Honors level courses in English, Math, and Science. ROP Courses in culinary arts, agriculture, computer science, and sports medicine. Q— From a facilities and technology standpoint, what does Del Oro have to offer? Del Oro’s campus was born in 1959. 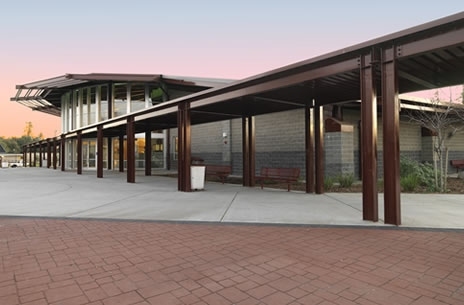 Over time it has gone through several renovations, most recently in 2003 with the construction of a state-of-art performing arts and administration building, and a new gymnasium named after former Del Oro Teacher, Coach, and Counselor Robert Bonner. In 2009, completion of a state-of-the-art Culinary Arts facility giving our students a very competitive edge in this CTE field. All students are equipped with chromebooks and receive a full service Google Apps account under the @puhsd.us domain. Grades are posted and reported by teachers using the Aeries software system, and parents have access to them using the newly designed “Parent Portal”. A brand new state-of-the-art Aquatics Complex was opened in 2017.